Our first night in Texas was February 23rd. It’s taken us quite a while to “waltz across” this state. However, we’ve reached our farthest point east (maybe) and our farthest point south (maybe). We’re turning and heading in another direction soon. After all every place north will soon start having nicer weather, snows will melt and the clouds will go away. That’s how it works, right? Besides it’s going to start getting pretty dang hot in the south. We experienced a little of that the other day when the humidity reached 99%! We’re thankful it was just one night and not more. We had some pretty great days in Corpus and on Padre Island. Then, the winds started howling and when they howled, they really howled. The time came for us to move on towards Houston. After all, Terry and Sandi had a plane to catch out of Houston Hobby or we might have turned and headed northwest at that point. The 200 mile trip from Corpus to Houston was uneventful. We love uneventful trips. We know the Houston Elks is pretty full most of the time but we were lucky that there was a perfect end spot for us. It was the spot our friends, Paul and Marsha, recently moved out of ... so thank you for giving us your spot! Our little Garmin is up to date but we've still seen a few little hiccups from it recently. One was when Mr. Garmin directed us to turn left when we were on top of an overpass. That would have been a difficult trick and quite a drop. .
Another recent hiccup was when the Garmin was directing us to go straight and yet two lanes of the freeway went left and two lanes went right. We played a guessing game and we guessed wrong. The best trick of all was when we were downtown Houston and the little direction arrow was going around in circles. We’re thinking that perhaps the satellite was hidden by all the tall buildings. Saturday was another story. We were on our way to Beaumont, Texas to visit friends and check out the South Texas State Fair. After the trip we made to downtown Houston on Friday, there was no way we were going to get stuck in that traffic again. We started out before 8:00 AM hoping to miss the Houston traffic. We didn’t. 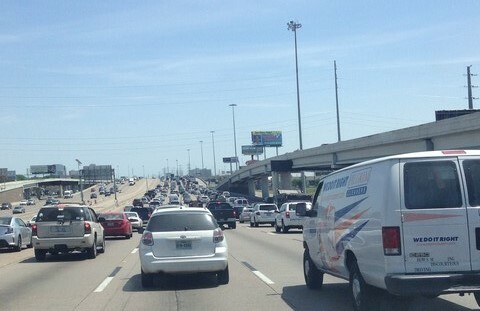 Houston always has traffic – always. Guess what I found before we left …. the battery charger for my camera’s batteries! Oh well … I still have a new one coming. Now I'll have two cameras. Jerry and Janice recently bought a house in the historic district of Beaumont. They have a lot of work they want to do on it but boy is it a gorgeous home. After we checked out the house, Duchess was introduced to their new puppy. We left the two of them together and headed for the fair but first we had to watch Janice's puppy put on a show for us. She was playing tetherball! Will you play tetherball with me? Sandi needed someone to ride on the rides at the fair with her. Jerry volunteered. He actually volunteered after we volunteered him. These are just a few of the rides they were on. Do you see them? They are upside down! They are upside down here too. Matter of fact, almost every ride they went on they were upside down. I think this is the only ride they weren’t upside down on. Her first taste of alligator. She said it tasted like tough chicken. Jerry and Janice drove us by a Beaumont landmark -- this huge hydrant was used in 101 Dalmatians. It’s huge! What a fun day we had. It was about a 200 mile round trip for the day. 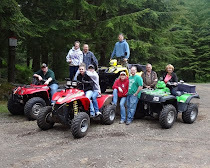 We had a great time and it was certainly worth it. Driving back to Houston gave us a different view of the big city. We were glad to get through it and on the other side. Sandi’s time is running short. By the time I blog again she will either be on the way home or already there and Terry will be back in Portland for another doctor’s appointment. Tomorrow she wants to go shopping so that's what we'll be doing. You sure are keep here busy and having too much fun. Houston has rush hourS. We listen to local traffic and it starts backing up at 6:30 a.m.-9:30 a.m. We have been there and done that! So glad we could give our spot to some nice people. I see you have new neighbors also. Janette and Chuck were about he best neighbors we could have asked for. I love alligator. The best place to get it is just about two miles down the road from you. It is called Razoos. Delicious...but not cheap. All their food is excellent. WOW...did those two buy a huge house. It looks lovely. Wishing Sandi a safe trip home. What a gorgeous house but it's sooo big. I love the new puppy. Jim wishes he was there so he could have gone on the rides with Sandi and Jerry. Not me. The ground works for me. Stay away from those storms. It makes sense for Jerry and Janice to move to Beaumont since their grandkids are there. But it is a big house!! Ed would have gone on those rides too. I agree with Sandie...the ground works! Wow, it looks like you've been having a wonderful time. I'd have to say I'd pass on the carnival rides! They bought a house! and they got another Boston. You sure had a good long time with Sandi. I imagine that Sandi has had a great spring break! Making memories and enjoying time together...precious. So eager to see where you go from here. Fried alligator !!?? I don't think so. I'm sure Sandi will remember this wonderful and very special time with you guys for many years to come. That sure is a beautiful looking house. I'm not too much for scary rides - especially upside down ones. Yikes! I don't do upside down! Two cameras is always better than one, isn't that just how it works? I know you will miss having Sandie around! And good luck to Terry in Portland!